What I liked the general concept of the strategy, the planets, etc and being able to send out things that you had no control over. So here is a sort of thought-spam reworking looking at different aspects. feel free to comment, suggest, etc. the look it very basic as it is the game I would like to focus on. the big yellow thing is the sun - which always sits at the center. the population has a max, and wont grow beyond the max. my thought here was when the max was reached you then have a point/s you can add to one of the core things. if the population reaches max - and you gain a "point to spent" you have to consider the amount of population to "cut". If you cut too few, a big planet (with big population max) will give you point after point (as it wont get conquered too fast). Also Research Point generation can be directly connected to the populations loyality (or "happiness"). In Genus Prime I planned a bit to have the RP production be connected to "free" population units. So if you have eg. 20 missile slots then only the "population - 20" amount of people can do research. This adds to every other "job" people on a planet could have. But bare in mind that this adds kind of complexity which does not fit to a more or less fast paced "action strategy game". This is more for the "tinker, optimize, plan ahead, ..." type of games. Same for upgraded ships (transporters, destroyers, ...). PS: As I did not have the time to add asteroids or other "interstellar objects": hope you add such accidental events (asteroids striving planets to destroy them, decrease population - or at least move their position a bit). 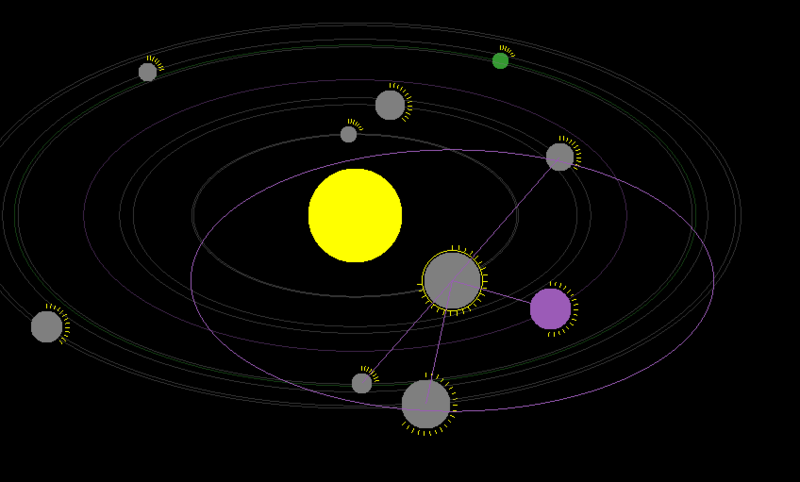 PPS: I just had another cool idea - dunno how to implement it "control" wise - but it might be interesting if the planets actually rotate around the sun. This can be done in a slow paced way so that a mouse user still can easily catch up. So why to do such a thing? 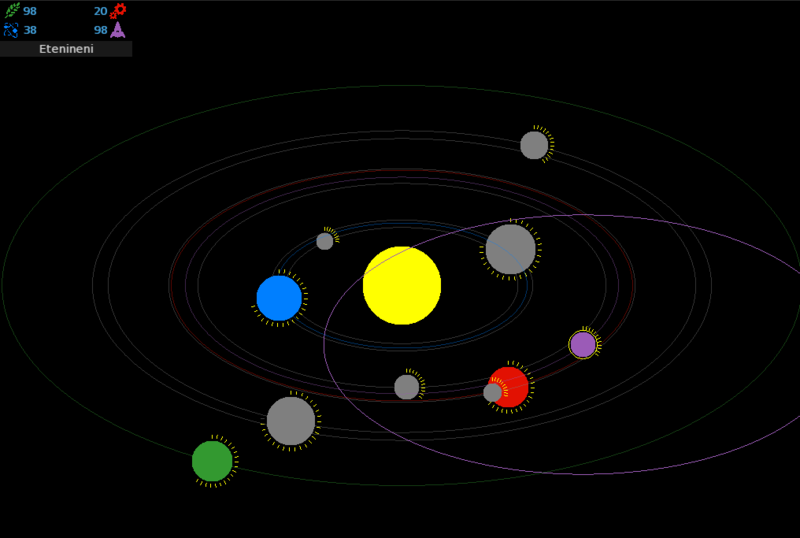 Imagine that some planets rotate faster than others around the sun (really?!!?). This means that some planet's distances to other planets differs - and so sometimes a planet is in ship reach, and sometimes not. This could add another strategy element. 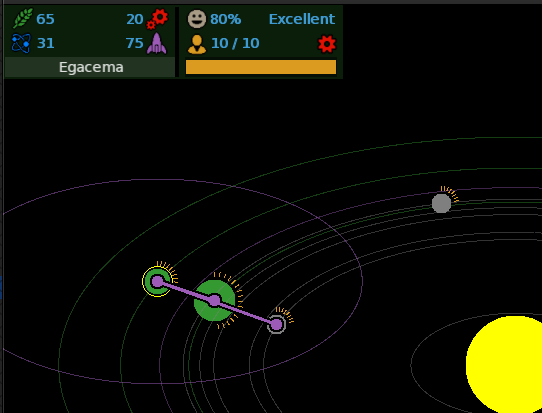 Overlapping planets (see orange and gray) might result in selection issues (if bigger planet is on top). So maybe keep it "top down" and the distance big enough to never collide ? Exception is if it becomes a 3D game. Just another small idea to throw in: moons and belts/rings. Belts could increase production of something (so more an "indicator"). the moons idea is very interesting - but I think that is getting just a bit more complex at this stage. selection is not an issue. it seems to work very well. as planets move, these lines appear when in proximity. Of course the planets are all moving, so you will have to make adjustments. Really curious to see where you guys end up going with this. Derrons game took a couple of go's to work out what I was doing when I first got it going but, once you get it, it's a really clever game. Considering it's only a small project it will be interesting to see a bigger game design based on it. You needed multiple games to gasp what you need to do? Thats what I meant with being "blind" as developer - you think everything is self-explanatory by just looking at it. One of the reasons why I started to add tooltips to icons in TVTower. Think other parts in a game should receive some kind of "quick help" system too. Hit "F1" and the game stops + some tooltips to areas appear to explain what is there and what can you do with it. Hit F1 again and the help is gone + the game resumed. Also interesting is, that in the "crash video" of Qube it already looked as if he was pretty used to this gameplay + controls. Looked very experienced. Already am excited to get your feedback (and maybe also some of the others). Of course I would like to read that you (and others) liked it - as creating something which is enjoyed by others is a pretty cool reward for me as developer. We - or most probably _I_ - should not push too many new ideas towards IWasAdam as the prototype might else do not longer _evolve_ but _mutate into something which Adam then no longer wants to develop further. Seems at least as if he settled already to the scifi-theme with planets. Some talk here already made me fill an old envelope (free paper notes ;-)) with sketches and rough ideas for an fantasy/medieval trading sim utilizing this "send and no further control" principle. 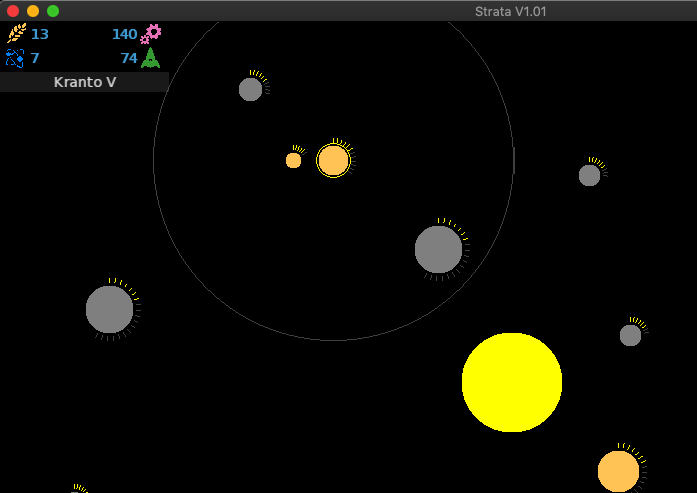 Second bit of the ui being worked on, this replicates the planet population, so at a glance you know what is going on.
. Already am excited to get your feedback (and maybe also some of the others). Of course I would like to read that you (and others) liked it - as creating something which is enjoyed by others is a pretty cool reward for me as developer. I was intrigued and amazed at the gameplay after sending stuff out from your planets that you'd no control over. The shear fluidity of the gameplay hit me straight away and has defo got legs. Being a fan of homeworld and the like this game stands out for uniqueness that grabs you from the off. Testament to it is Iwasadam moving the idea forwards already....kool and the gang! There is a time/strategy element as the planets rotate, so you will need to decide how you build up 4 core things. then decide how to use them. Some initial testing is working well. My thoughts now turn to travel. 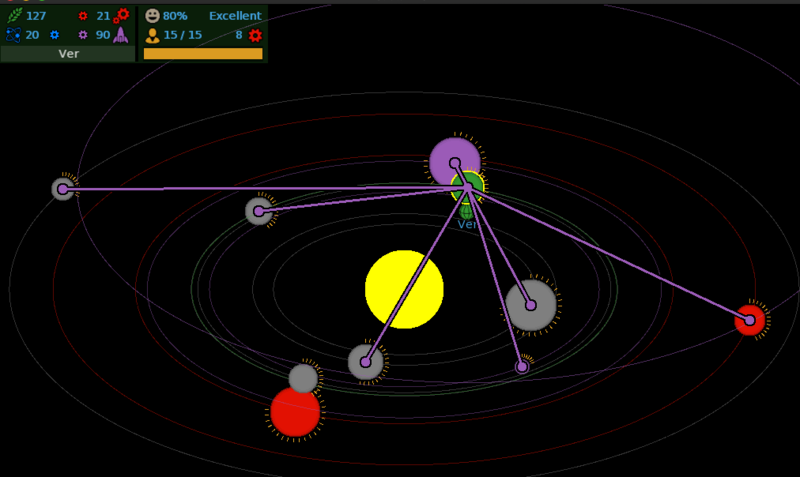 in general operation you leave the planets to themselves as you are dealing with 'your' planet. Thus research points build up.